So, if one is sharp of wit and clear of mind one may have noticed a sudden lack of spinning posts, and despite what they say about giving more than one reason showing that you're lying, I do, in fact have two very good ones. Three, actually, now that I think about it. 1. I went on holidays, with three other girls. In one car. With all our bags. No room for Daisy at all. Honestly, I wasn't even going to suggest it. I imagine my friends, who I have known ever since I could still reasonably claim to have a "-teen" suffix on my age, might get a bit offended that I was busy spinning when I should have been busy bonding. 2. The Tour de Fleece people were forced to change the rules! Now, this is something that seems to have made a lot of people happy, but it's disappointed me terribly. When I found out, I rushed in here and drafted up a few grumpy-sounding posts on the subject, then realised they sounded, well...grumpy, so I gave up. Now, with at least a week of sober reflection I can confidently say that I'm still disappointed. You see, last year, my first year as a competitor, was great. You spun, you took the best photos you could, you posted them and got completely trampled under the weight of talent. God, I squealed and cried as I looked at page after page of yarn that was spun and photograhed so expertly that it made me feel like I'd never get anywhere. I spun and photographed my best, though; it's the only way to learn. So, when this year's competition dawned, I was comfortable in the fact that I had more-or-less spent the last year improving with both wheel and camera. I was ready for action. I was going to spin my pants off. Did I expect all this effort to win me a prize, course not! I'm good, but I'm not that good, and besides, it's not about the prizes. But I did expect my efforts to be worth a shot, and I expected to get a thrill from watching those love clicks getting totted up. So, when all the new people this year started clicking loves before voting had been opened, like they were going out of fashion, I despaired. The moderators were going to have a huge job ahead of them cleaning up the mess. Glad was I that I was not in their shoes, but it really bothered me. All those love clicks were going to go to waste for all those spinners out there. And, as a result, the voting has been altered from a peer-vote to a random one. Personally, I can see no other way the moderators could have solved the problem of people just... not... reading... the ...rules. Far as I'm concerned, it's rude not to read all you can on a thing before you participate. So, all those people saying "I'm new, I didn't know what to do" were just being a little bit lazy. This makes me sad because last year, I read, I made sure I understood, and I voted at the right time. After that, I'm sorry to say the sense of competition has totally gone out of it for me, and I can see that the quality of the photos, and to some extent, the quality of the spinning has gone down a bit too. It no longer matters what you put up if you're randomly chosen. 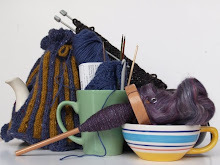 With Ravelry set up the way it is, I really don't see any viable way of keeping the voting going in the face of so many people getting the system muddled, so I have no solutions to suggest. If I did, I'd contact a mod. So, there you go. 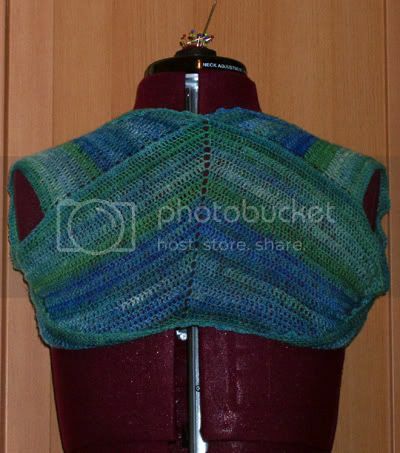 Instead, I used some of my homespun to make this shrug in the style of Etain, but without the ribbing. I have to say, I'm really pleased. 3. Daisy developed a wobble, that then turned into a dangerous swaying, which lead to the flyer coming undone several times and zooming off in the direction of the boyfriend. No-one was injured, though we both got a surprise. oh dear; you didn't mention the Daisy-wobble. Is she fixable?